Parks are one of those places where you get to know the spirit of the city in a special way. The rhythm of everyday life intertwines with a relaxing, silent atmosphere that transports the visitor out of town and often in some ancient times that Belgrade parks remember. There are more than 60 parks and picnic areas in Belgrade, and we recommend five that, in our opinion, you should visit when in Belgrade. One of the most charming parks in the very center of the city is located close to several faculties and Kapetan-Misina building, one of the most famous buildings of the 19th century in Belgrade. The park was built in the 19th century at the place of former Great Open Market and today is a very live place, perfect for a break for students and parents with children. On a relatively small area of the park, there are more than 21 species of trees, and of the oldest tree in the park, Japanese Sophora that has been cut after 120 years, a bench was made and placed on its place, an artwork of sculptor Bogdan Vukosavljevic. Botanical Garden Jevremovac is a true planet of plants. It is a magical place, in the heart of the city, that, with its rich vegetation, shady Japanese Garden and beautiful old greenhouse building, leads you to a totally different dimension of enjoying in nature and freshness. In the area of about 5 hectares, in the open space, there are more than 350 species of trees and bushes, domestic, European and exotic species, and the total plant fund now includes more than 1,500 plants. Garden Jevremovac, which has a cultural and architectural character, was built in the 19th century on the initiative of Josif Pancic and is one of the oldest in the world. Working hours: from 1 April until 1 October, every day from 9 to 19h. The place of rich an interesting history and even more interesting position, since it is located above famous city caves, the center of city events during the 60s and 70s of the last century, Tasmajdan is still the heart of the city and one of the most favorite parks of Belgradians. This modern park offers variety of facilities: numerous walking paths, trim trail, children’s playground, place for chess, fountains and sculptures, cafés and restaurants and there is a Church of Saint Mark. Topcider Park, the first public park in Belgrade and Serbia, is protected as a monument of nature. The beauty and elegance of this park are definitely worth of leaving the city center for a short while and going to Topcider. This former royal park, thanks to its romantic spirit, is specially popular for newlyweds, but also as a place where you can completely relax and enjoy the nature. Museum of Prince Milos Residence is situated in this park and in front of it is the famous old plane tree, more than 170 years old and over 34 meters high. And for the end, if you have to choose to visit only one park, that would definitely be Kalemegdan, the largest park in the city, located in the middle of the Belgrade fortress. Numerous facilities of Kalemegdan: tours at museums, galleries, cultural and historical monuments, fortress and the Zoo, entertainment activities, enjoyment of nature and the view of the confluence of Sava and Danube rivers, make Kalemegdan the ideal place for all-day fun. 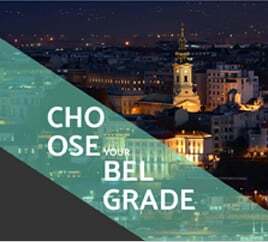 Our recommendation: complete the visit with our Phototour Belgrade and take the most beautiful photos of your visit to Kalemegdan.